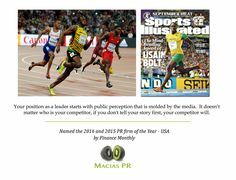 The tech and healthcare PR firm, Macias PR, has released its quarterly report detailing media placements the firm secured for its clients from April – June 2017. The top tech PR firm secured media placements with the most influential online and news organizations in the USA. In the 2nd quarter of 2017, Macias PR secured media coverage for their clients with Bloomberg News, ValueWalk, Huffington Post, New York Post, Channel 11 in NYC, Elite Daily as well as targeted B2B publications, like the American Journal of Managed Care, Accounting Today, Med City News, and Nonprofit Quarterly. Macias PR works with clients from different industries throughout the year. In the second quarter, the PR firm led media campaigns for clients in digital health, consumer technology, accounting technology and the nonprofit industry. In June 2017, the New York Post ran a front page business story on a consumer mobile app that is revolutionizing the way people buy their prescriptions drugs. The free discount medical card allows consumers to compare prices in their neighborhood for any prescription drug. A popular morning TV show in New York City also ran a 2-minute segment on the product. In May, Macias PR launched a media campaign for a rebranded technology company that was targeting nonprofits. The team at Macias PR secured six media stories for the new client in the first five weeks. In July 2017, the tech news aggregator, TechNewswires, selected Macias PR as one of the best tech PR firms in the boutique and mid-size category. Macias PR was also selected as one of the best PR firms in the healthcare category. None of the PR firms named in The PR App paid any compensation for the selection. Macias founded his PR firm in 2009 after an extensive career in the media. He is a former Executive Producer with NBC, Senior Producer with CBS in New York and author of the book Beat the Press: Your Guide to Managing the Media, which was featured on Fox Business, New York Times and New York Post. Macias is also a frequent contributor with CNBC and The Daily Caller, providing PR advice, branding tips and media analysis on the business landscape.